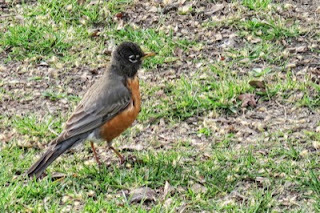 The photographs atop this blog entry are of an American Robin that I came upon when I was walking in Central Park. 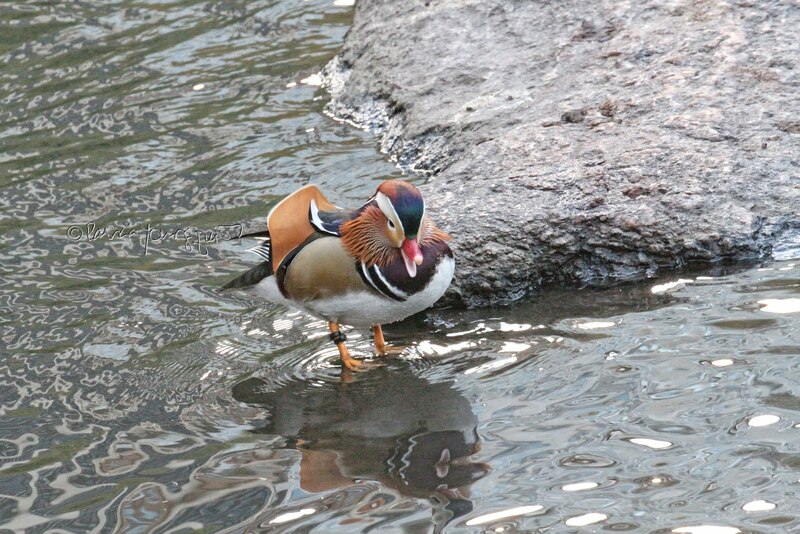 I've seen a number of members of this bird type during my walks in Central Park, which is a fact I mentioned here on Blogger. I've also seen them when I've cycled (on a tandem) to The Little Red Lighthouse, but on those occasions it is usually too dark to take a decent photograph of this (or any) bird type. When I first started noticing the presence of robins in both Central Park and near The Little Red Lighthouse, I nearly had a long term case of ohrwurms caused by my recalling the song "Rocking Robin." 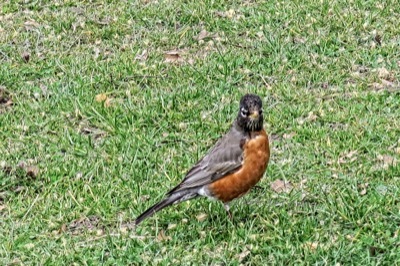 Ohrwurms, as you may know, is the term given to the "condition" of having a song stuck in your head and seeing robins on a daily basis as I walked through Central Park, certainly prompted me to sing,"He rocks in the tree tops all day long .... Hoppin' and a-boppin' and singing his song. 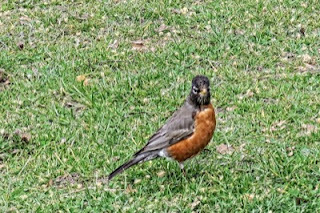 All the little birdies on Jaybird street, love to hear the robin go tweet, tweet, tweet... Rockin' robin, rock, rock, Rockin' robin, rock rock...."
But in reality the robins I saw in Central Park or near The Little Red Lighthouse were not "rockin' in the treetops," but they were "hoppin' and a-boppin" across the ground. And I never heard any of those robin go "tweet, tweet, tweet!" They have all been silent. 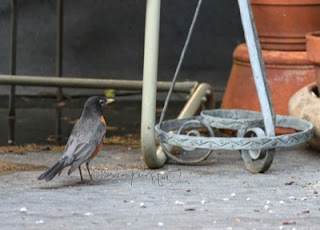 Being silent was also the way a lone robin behaved when he visited my urban (NYC) rooftop garden. I nearly missed his visit because of this behavior, for much of my ability to observe birds is from my hearing their "voices" before I see them. To my knowedge a robin has never visited my garden and being graced by a visit from one took me by surprise. Prior to this I had not been able to see robins for a few weeks! This is because the accident I had left me with injuries that have made my normal routine of walking through Central Park to attend training sessions very difficult, so much so that I've had to reschedule many of the sessions. Moreover, because of the accident, I've had to stop tandem cycling (for now), so I also haven't seen the robins who spend time near The Little Red Lighthouse. But I digress! 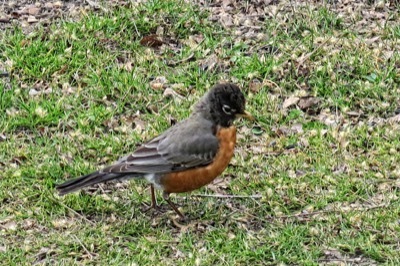 My not being able to see robins made the visit from one even more special. It was so unexpected that it left me awestruck and mesmerized. By the time I even thought about taking his picture, he was gone. In any event, as I went through a litany of would've-shoulv'e-couldv'es re not getting the robin's photo, I tried to focus on how special it was to see him visit my garden; and I attempted to follow the truism spoken by White's aunt: allow my remembrance of seeing a robin in my garden be sufficient. But I am not as pragmatic as White's aunt! I spent the remainder of the day obsessing about my not getting a photo of the robin in my garden. 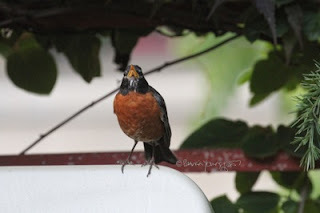 I took my obsession to GOOGLE and learned a few things about robins. 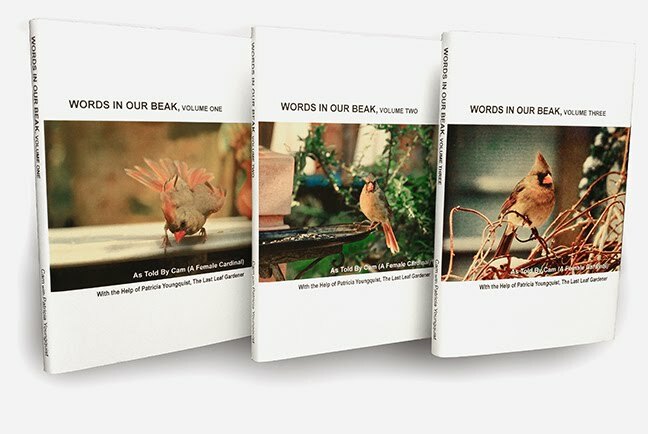 One of the things I learned gave me another bout with ohrwurms because I came across three versions of "When The Red Red Robin Comes Bob, bob, Bobbin' Along." 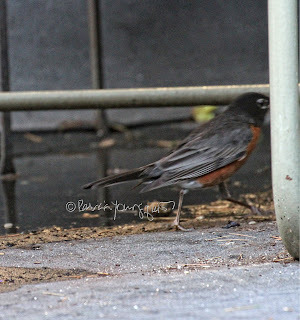 After hearing three different singer's rendition of "When the Red, Red Robin Comes Bob, Bob, Bobbin' Along," it's rather hard to stay in a funk about not getting a picture of a robin! Still, I knew that if one came "bob, bob, bobbin' along," it would be much easier to have "no more sobbin'." However, I was surprised that the promise of "no more sobbin' when he starts throbbin' his old sweet song," was hardly the case for Emily Dickinson. The following is her poem about this bird type. Dickinson's work reminds me of Sylvia Plath's poem re tulips (you may refer to this poem by clicking here). 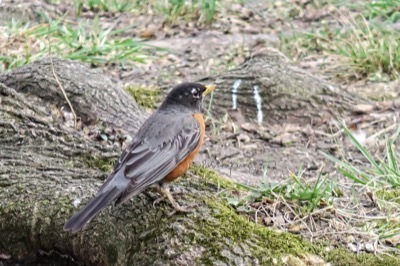 In any event, while at times I've felt the despair that both of these writers have expressed, I have been able to be consoled by the sight of flowers, including tulips; and I've been comforted by seeing birds; including robins. Therefore, I was very moved when the robin — at least I think it was the same one — came back later that evening. And I think I'm right in believing that the robin who visited my garden was a male. 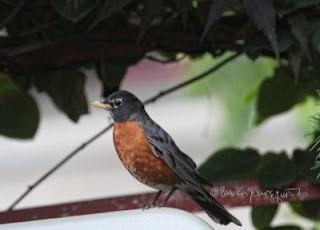 All the materials I've read on the subject of a robin's gender support my belief. I've learned that the breast on male robins is a rusty red, which is certainly the case with my visitor. 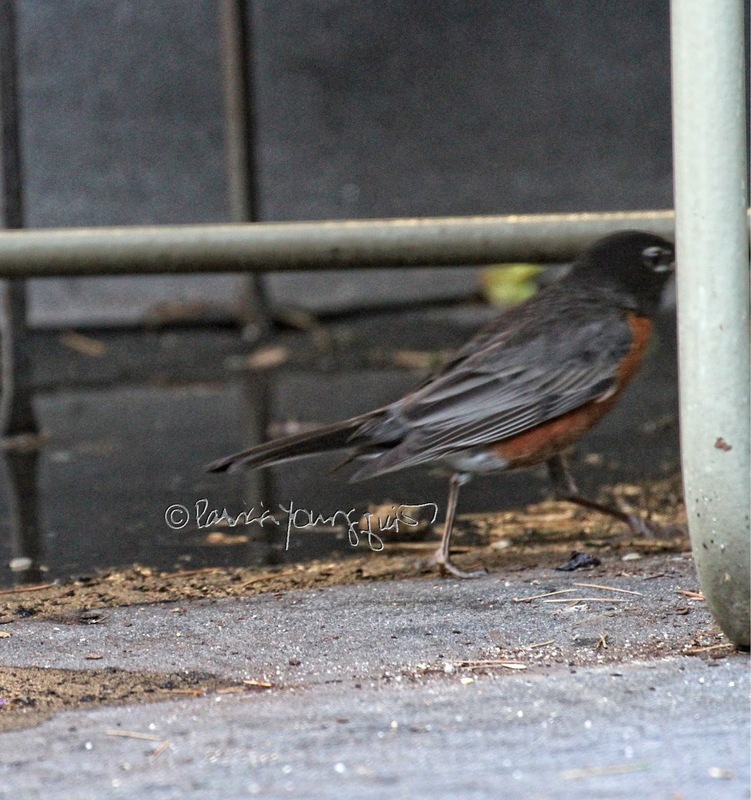 I've also learned that the male robin's head is "almost black," which also seems to be the situation with "my" guy as evidenced below. 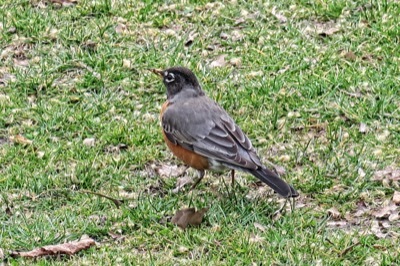 Moreover, Cornell points out that male robins have "gray upperparts," and the robin who visited me has this characteristic too, as evidenced in the picture below. 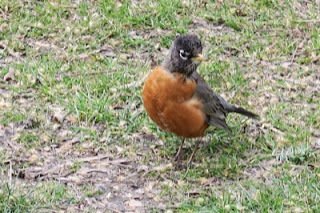 But even though this robin has the physical traits that would indicate he's a male, his behavior does not indicate this gender! According to a number of sources, only the male robin sings. The little guy that I've been referring to here has not uttered one tweet! And as I've said, this is the same experience I've had with the robins I've encountered in Central Park and on the grounds bear The Little Red Lighthouse. They all go bob bob bobbin' along but have yet to sing a song!